(Nanowerk News) Carbon nanotubes hold many exciting possibilities, some of them in the realm of the human nervous system. Recent research has shown that carbon nanotubes may help regrow nerve tissue or ferry drugs used to repair damaged neurons associated with disorders such as epilepsy, Parkinson’s disease and perhaps even paralysis. Yet some studies have shown that carbon nanotubes appear to interfere with a critical signaling transaction in neurons, throwing doubt on the tubes’ value in treating neurological disorders. No one knew why the tubes were causing a problem. Now a team of Brown University researchers has found that it’s not the tubes that are to blame. Writing in the journal Biomaterials, the scientists report that the metal catalysts used to form the tubes are the culprits, and that minute amounts of one metal — yttrium — could impede neuronal activity. The findings mean that carbon nanotubes without metal catalysts may be able to treat human neurological disorders, although other possible biological effects still need to be studied. Jakubek took single-walled carbon nanotubes to the laboratory of Diane Lipscombe, a Brown neuroscientist. The researchers zeroed in on ion channels located at the end of neurons’ axons. These channels are gateways of sorts, driven by changes in the voltage across neurons’ membranes. When an electrical signal, known as an action potential, is triggered in neurons, these ion channels “open,” each designed to take in a certain ion. 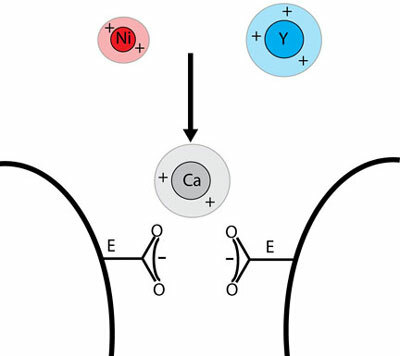 One such ion channel passes only calcium, a protein that is critical for transmitter release and thus for neurons to communicate with each other. In experiments using cloned calcium ion channels in embryonic kidney cells, the scientists discovered that nickel and yttrium, two metal catalysts used to form the single-walled carbon nanotubes, were interfering with the ion channel’s ability to absorb the calcium. Because its ionic radius is nearly identical to calcium’s, yttrium in particular “gets stuck and prevents calcium from entering and passing through. It’s an ion pore blocker,” said Lipscombe, who specializes in neuronal ion channels and is a corresponding author on the paper. The experiments showed that yttrium in trace amounts — less than 1 microgram per milliliter of water — may disrupt normal calcium signaling in neurons and other electrically active cells, an amount far lower than what had been thought to be safe levels. With nickel, the amount needed to impede calcium signaling was 300 times higher. “Yttrium is so potent that ... a very low nanotube dose” would be needed to affect neuronal activity, said Robert Hurt, professor of engineering and a corresponding author on the paper. Jakubek said she was surprised that the metals turned out to be the cause. “Based on the literature, I thought it would be the nanotubes themselves,” she said.